Midgley United manager Craig Gee. Having already been eliminated from the Skircoat Green Physiotherapy Challenge Cup already this season, Midgley United will be hoping for more luck in Saturday’s Halifax FA Albert Crabtree Cup tie with Brighouse Sports. United have been in good form since that disappointment against Warley Rangers Halifax. They showed their capacity for cup success with a huge 5-1 win against Salem in the WRCFA Challenge Cup. 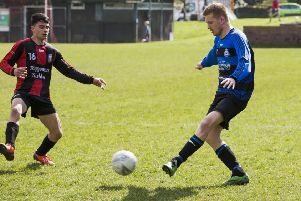 The momentum continued for Midgley as they beat Copley United 6-4 last weekend, climbing up to third in the Premier Division, ahead of Ryburn United. The club have received another boost over the last fortnight, with manager Craig Gee winning the Calderdale Sports Senior Team Coach/Manager of the Year award. Club secretary John Murphy admitted he was not surprised to see Gee pick up the trophy. He said: “It makes complete sense. He’s had many years as a player and then taking over the coaching role with Midgley. Last year, both teams won the respective Halifax cups. “It’s a deserved award, to be honest with you. His dedication and the effort that he puts in is second to none. They are now only four points off top spot, but have to concentrate on cup duties this Saturday. Fixtures - Halifax FA Albert Crabtree Cup: Brighouse Sports v Midgley Utd (C Salmons), Calder 76 v Ealandians (A Kay), Huddersfield Amateurs v Holmfield (A Gee), Illingworth St Marys v Greetland (P. Bowe), Ryburn Utd v Salem (C King). Premier Division: Copley Utd v Mixenden Utd (P Crabtree), Warley Rangers Halifax v Shelf Utd (I Childs).